I may have just figured out that creating my venns at the end of the work1 day is a terrible idea because the only thing I can think about is food. Right now, I'm barely even thinking about this blog post. What I'm thinking about is how I'm doing it at the request of my big sister for her birthday, and if it's acceptable to buy myself some cake2 so I can feel like I'm celebrating with her. I love pasta. No, no, you don't understand. LOVE it. I used to make whole boxes of it in college and then get sad when my roommate wanted me to share. But, I don't order it in restaurants much because pasta is meant to be eaten pantsless. Pants just hold you in, and limit you to a serving! Pants stop you from passing out immediately after a bowl of delicious, delicious spaghetti drenched in artichoke marinara, topped with gruyere. No one wants that. Normally I like burritos. I like them for breakfast, I like them for lunch, and I like them for dinner. I like half-eaten burritos from the fridge as a midnight snack. Weirdly, though, you give me two sips of beer, and all I can think about is tacos. Maybe burritos become too intimidating, and tacos are like their non-threatening little sibling. Maybe I've been totally brainwashed by the awesome 3 tacos and a beer for 5 bucks deal at my local taco Tuesday. All I know is that going to the taco truck that sits outside my favorite dance spot at the end of the night feels like the arrival of the Messiah to me. Sometimes I make dinner, and my ladyfriend3 is all like "Wow, this is so good, what did you put in it?" 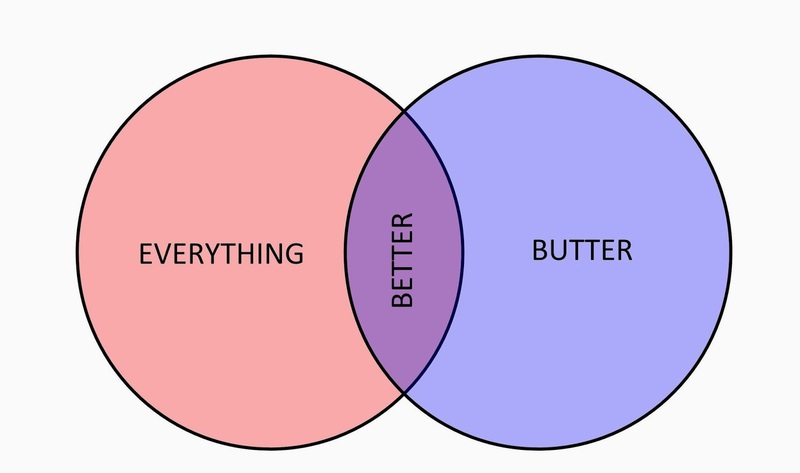 and the answer is always "Butter." I can feel my doctor's disapproval and my arteries clogging as I type this, but whatever that thing you're eating is - it would be better with butter. Onions? Obviously. Pasta? Duh. Burgers? Food & Wine swears by it. Fish? Why bother without it. Butter. Just add it. 1 - I misspelled this as "wok" at first, which seems very appropriate.